Oh, what a trip we’ve had! We are back home now, so I want to tell you the rest of our story. 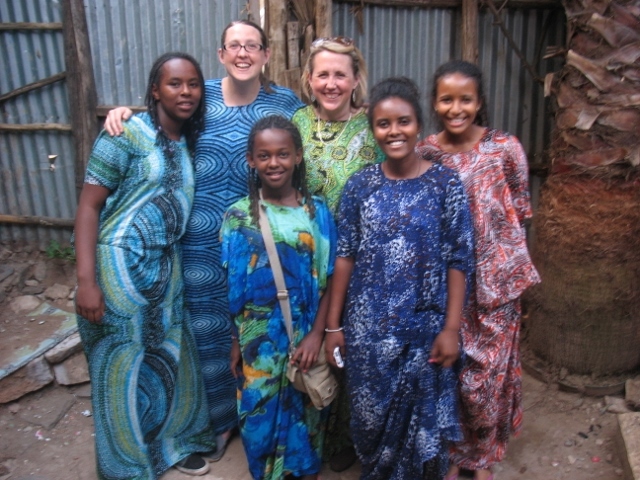 In Harar, we saw many ladies in dresses that they called pyjamas (pee-JAH-mahs). Women and girls of all ages wore these very lightweight dresses, often with a head covering as well. One day we wandered through the market in Harar, picking fabric we liked. About $4 per person bought the fabric, and then for another dollar, seamstresses sewed the fabric into dresses in 15 minutes or so while you waited. Fabric options were many, making it very hard to decide. The fabrics and patterns we chose were (believe it or not) smaller-patterned and more muted than many we saw. Here we are modeling our pyjamas. They are exceedingly comfortable, and– funny factoid– you get the tucking-in at the hip by tucking the sides of the fabric into your underwear. We all wore our pyjamas around town one day. I couldn’t help but feel like the Ethiopians in our group wore them with more authority and panache than Sophie and I could muster up, but it was really fun. And the outfits are so comfy that I could totally picture wearing them as actual PJ’s in America. 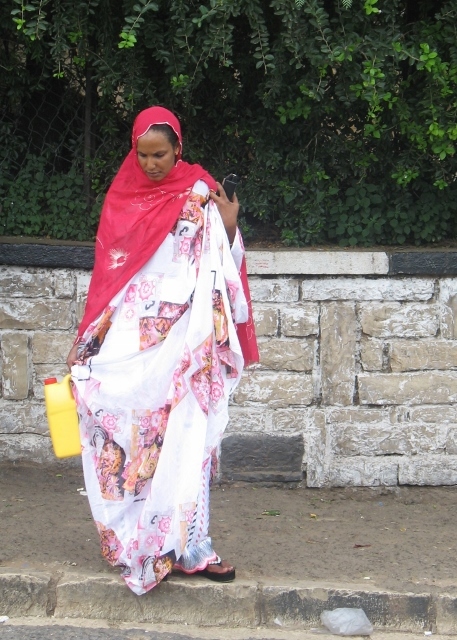 Here’s a Harar lady wearing hers. She has a lovely slip underneath hers, as well as, of course, a head covering. Very elegant. And it’s completely normal to own a cell phone these days, while also still needing to tote water to your house. Such interesting contrasts. One of the hardest things for me the entire trip was to ignore the beggars walking around. If you gave them money, even more would follow you, which would eventually feel very uncomfortable and intrusive. We experienced the most begging in Addis. Harar people were actually very respectful, however. At one point we were sitting in a neighborhood in our van waiting for Lidya and Zeytuna to get back from a quick visit with some family. The day was warm and so we opened our side van door. A couple little neighborhood girls watched us with interest, and when Julianna waved at them, one came to the door to shake hands with her. But then they beat a hasty retreat and went back to watching from a distance. Sophie said if we’d been in the same situation in Soddo, we’d have had 50 kids clamoring around the car door within minutes, and was amazed at how circumspect even the children were in Harar. 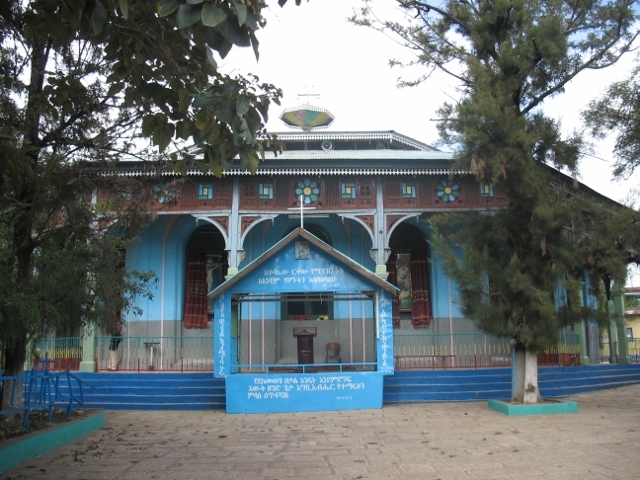 We had no trouble filling three days in Harar with visiting and shopping and touristing around. But by the end of our 3rd day we were more than ready to head back to Addis. Our hotel there in Harar was almost perpetually out of water, which meant we could only do wet-wipe ‘baths’ and did lots of bucket-flushing of toilets. Fortunately Sophie had had the foresight to bring a whole big pack of wet wipes, which along with the small packs I had, lasted just long enough. Sophie (in a room of her own down the hall from us) was being bitten in the night by unknown creatures. We are fervently hoping it was fleas, not bed bugs, and have a heap of laundry on the back porch that we are gradually HOT water washing as I speak just in case we brought any creatures back with us. We’re baking the suitcases in Hefty bags in the sunshine, too, just in case. On the bright side I only saw one spider and two cockroaches, so they must be doing some kind of critter control there. The hotel’s proximity to the market, though absolutely delightful fun during the day, meant that the evenings were very noisy until 11PM or so, ramping up to a dull roar again by 6:30 or so in the morning. One morning we had a very loud man singing at the top of his lungs, Ethiopian-church-style, right under our windows at 6 AM. On the bright side, the Belayneh hotel has a very nice hot breakfast complete with fresh-squeezed orange juice, scrambled eggs, fresh bread, and the very best coffee we had in all of Ethiopia. Breakfast for 6 of us was a total of $10USD– crazy affordable. Always, Julianna scarfed down her eggs like lightening, as they tended to be the most familiar food we had all day. In Harar there are many sambusa sellers. Sambusas are little fried bread packets with lentils or potatoes inside, and cost only 1 birr each. 20 birr is $1USD, so they were a very affordable quick meal. Many that we bought were mildly seasoned, but one batch ended up being insanely spicy, leaving everyone but Lidya carefully picking everything green out before each bite. Here’s a recipe for beef sambusas and another for lentil sambusas if you want to try making some yourself. And here’s a fun video in Amharic showing how to make zilzil alecha, another Ethiopian dish. One other fun food factoid about Harar: the Teodros Hotel had been recommended as a good place to eat. Once there, we found it to be only moderate. But the very kind owner stopped at our table to chat with us, and when he heard Julianna wanted french fries, he sent one of his workers out on a fry hunt. He ended up with potato chips (‘crisps’), not fries. But we were very touched that he tried so hard to please us. Goodness, this is getting long! I will quit now and try to finish out our story in one more post. Thanks for following along. I’ve so much enjoyed hearing from all of you as I’ve shared this story. I am thoroughly enjoying the story of your trip and all the wonderful cultural details. What fun to have dresses made while you wait! A note regarding your (hopefully not) bed bugs… http://www.bedbugger.com is an excellent reference. And anything you’re concerned about (I.e. anything you brought back with you) won’t be safely exterminated by simply washing- it’s high heat, like tumbling in the dryer, that kills those little pests. Bed bugs are much harder to get rid of than your average bug, so it would not be surprising for a hotel to have them even if other posts are well controlled. I don’t want to cause any unnecessary alarm, just wanted to share a few things to be aware of. Yes– our dryer has been running full bore for days now! THanks for the reminder, and I am so glad you are enjoying the cookbook! Diatomaceous earth is also helpful – I’ve heard it causes their shells to be scratched so they dehydrate. If you put it in a ketchup type bottle from the dollar store and “dust” it out the top in little poofs, into the edges and cracks of things like the suitcases, it could help. Basically they remind me of mosquitoes that are hard to kill. Terrifying, and then, oh, hey, they are just bugs. Hard, but possible, to kill. Good luck – I’m hoping you didn’t bring a single one home!!! I love it! I can’t believe you’re already back though because that was way tooooo fast! Thank you, and to your girls, for sharing! I’ve really enjoyed following your journey! Mmmm…love sambusas (Iraqis love them too so I get them plenty)! How fun to be right next to the market. And most very poor Mauritanians had cell phones before I did. They’re cheaper than land lines, you only pay for what you use, and that’s the way of the world. I think it’s so odd when people complain about Syrian refugees having cell phones. It shows they haven’t traveled, I always think.